This picture pretty much sums up my football career in Flint. It was taken in the St. Mary's cafeteria when we celebrated our 6-0 season in 8th grade. (Yes, those are purple converse with gold laces.) Bill Suttles is responsible for the broken arm. And Pat McGinnis did the honors in freshman football the next year at Powers. Same broken arm after the same pathetic arm tackle. 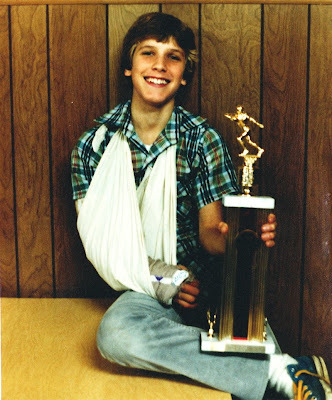 Thankfully, soccer was added at Powers, saving me from further injury and humiliation. McInnis broke my arm that year in my seventh grade, same arm tackle in practice so I missed the game against St Mary's as a 7th grader and other games as well. I guess tackling a 6ft 2in man in an 8th grade body, as a 5ft, 80lb boy can be detrimental to your arm. By the way had to have my arm re-broken as it healed wrong due to my playing football in my initial cast. R Daly, hmmmm, this wouldn't happen to be our fearless goalie, would it? Who knew we had similar encounters with Pat. Not sure how many games I missed freshman year; it didn't really matter because I was riding the bench anyway. Looks like the trophy makes up for some of the pain! Way to show school spirit with those converse. Being a Rosary kid I had the blue in white. Are those teeth post-braces or pre-braces? They are beautiful!! I just bought my 14 year old a new pair of low top converse. They still smell like rubber. No braces! Unfortunately, teeth not so great now.